WHAT IS POP ART ? 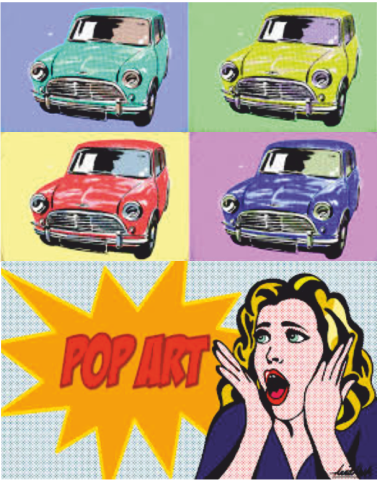 Pop Art was originally an Art Movement, with artists such as Andy Warhol and David Hockney producing colourful screen prints. Every day objects were often painted and reproduced as cheap prints and sold to the general public. These include coke tins, dollar bills and comic strips. 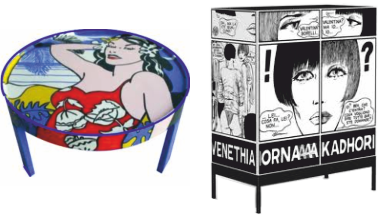 Pop Art has been applied to product design - e.g. furniture. Warhol produced his art work ‘Campbell's Soup’ in 1962. Pop Artwork like this is regarded as an Iconic drawing of the 1960s. Images stand for popular culture. The images are often consumer products - e.g.soup cans and coke bottles. Pop Art is colourful and distinctive. Multiple copies printed and sold to the general public. Andy Warhol’s original 1962 Cola Bottle, sold recently for $35.3. Famous Pop Art originals tend to reach very high prices, at auction.